Loyola University New Orleans is hosting a free, public talk with the Rev. 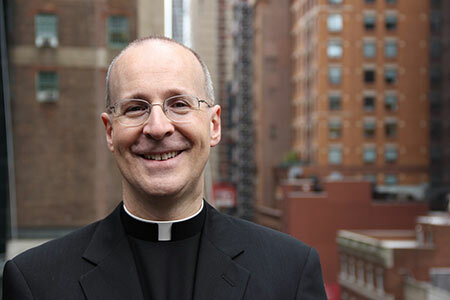 James Martin, S.J.—probably one of the most well-known Jesuit priests in the nation—verified by his 44,800 Twitter followers and guest appearances as chaplain for the popular late-night comedy TV program, “The Colbert Report” with Stephen Colbert. Martin will headline Loyola’s Presidential Guest Series Saturday, Oct. 25 at 7 p.m. His talk will be followed by a book signing. Martin is also the editor at large of the national Catholic magazine, America, and New York Times bestselling author of “The Jesuit Guide to (Almost) Everything.” For his latest book, Martin brings the Gospels to life in “Jesus: A Pilgrimage.” During his Loyola talk, Martin will draw inspiration from his latest book to invite believers and seekers alike to experience Jesus through Scripture, prayer and travel. The talk takes place in the Louis J. Roussel Performance Hall located on the second floor of the Communications/Music Complex on Loyola’s main campus. The talk will also be streamed live online. Besides his many best-selling books, Martin's articles are also featured in Catholic publications like America, Commonweal, U.S. Catholic, Catholic Digest and The (London) Tablet. Martin is also a frequent contributor in The New York Times, The Wall Street Journal, The Boston Globe, The Chicago Tribune, The Philadelphia Inquirer, O Magazine and other newspapers and websites, including Slate.com, The Huffington Post and The New York Times and The Washington Post websites. Martin maintains an active presence as a commentator on the topics of religion and spirituality in national and international media, and he has appeared on all the major radio and television networks, including National Public Radio’s “Fresh Air with Terry Gross,” “Weekend Edition” and “All Things Considered,” in addition to PBS’s “Newshour,” Comedy Central’s “The Colbert Report” and Fox News Channel's “The O'Reilly Factor.” He is also featured on ABC, NBC, CBS, CNN, MSNBC, PBS, The History Channel, the BBC, Voice of America and Vatican Radio.